If you’re a garlic-lover and garlic grower like me, you’ve probably got a bunch of it either in your garden or in your home right this very moment. These beautiful and delicious plants have so much versatility in the kitchen that I like to grow a big patch of them every season and store them for use throughout the year. But storing garlic can be a challenge if you don’t know what you’re doing. 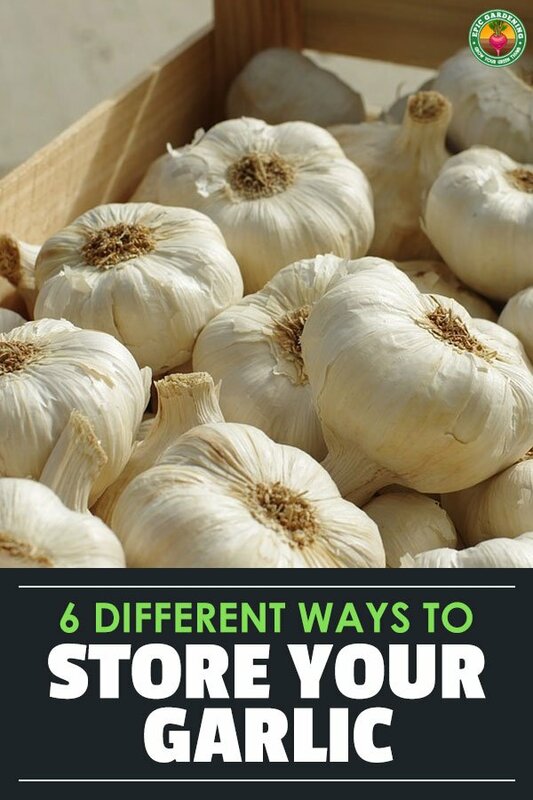 There are a lot of different methods for storing garlic, some better than the others. Let’s take a look at exactly how to preserve your garlic the right way so you can enjoy these flavorful bulbs for months to come. If you’re purchasing your garlic, you’re looking for firm, fresh bulbs with dry, papery skin on the outside. If the bulb is soft, it’s probably too ripe and won’t last long in storage. Also avoid buying garlic that is refrigerated. There are many types of garlic, but their storage is all similar, so don’t worry about that. If you’re selecting bulbs from your garden, choose ones that look healthy and undamaged by pests or ​disease. Garlic curing in a warm, dry place with air circulation. After you harvest your garlic patch, you must cure it before you can properly store it. 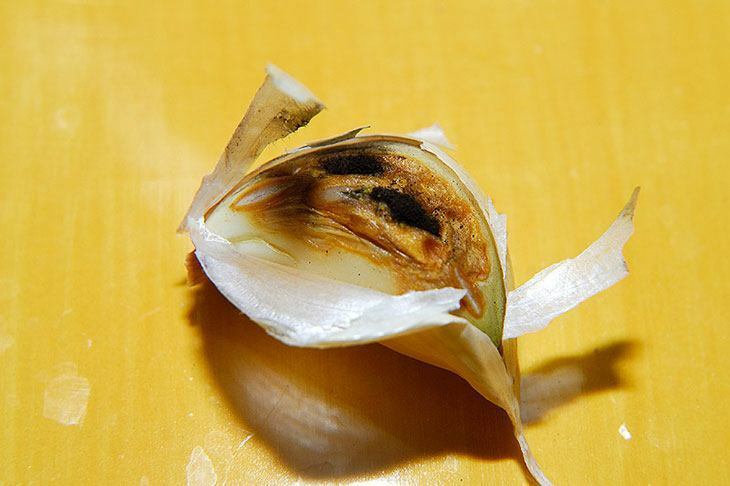 The curing process makes sure that the remaining energy goes to your bulbs (since that’s what we care about when we grow garlic). 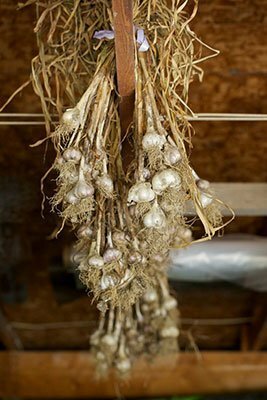 The easiest way to cure garlic is to tie it in 3-6 plant bunches and tie to a string. The strings should be located in an area with great air circulation and the ideal air temperature is around 80°F (27°C). Leave your garlic curing for about two weeks. You’ll know it’s done curing when the skin is dry and paper, much like the garlic you’d buy at a store or farmers market. Garlic must be cleaned after curing to ensure good storage. After your garlic is cured, you have to clean it up a bit before storage. 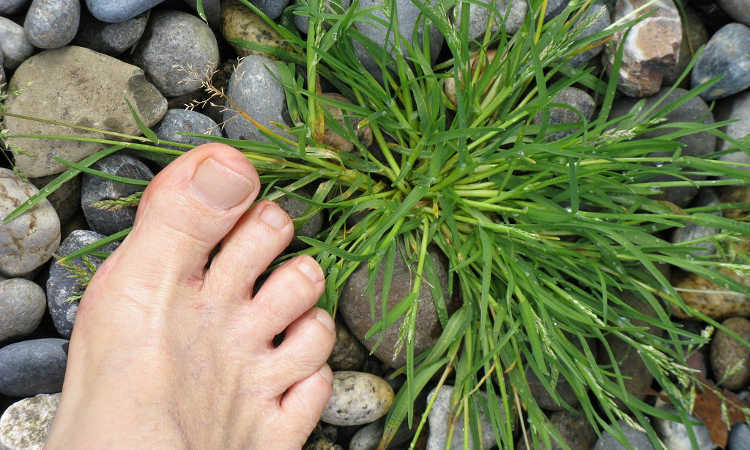 Brush your hands along the roots — they should be brittle from the curing process and come right off. Trim off the tops, but be careful not to cut too close to the bulb. You don’t want to expose any of the cloves to air. If you’re cleaning hardneck garlic, leave the necks on so you can crack them open easier in the future. Cleaning Tip: If you see any damaged cloves that you missed earlier, remove them from the bulbs. If some of your bulbs are soft after curing, use them in the kitchen instead — they won’t store well. 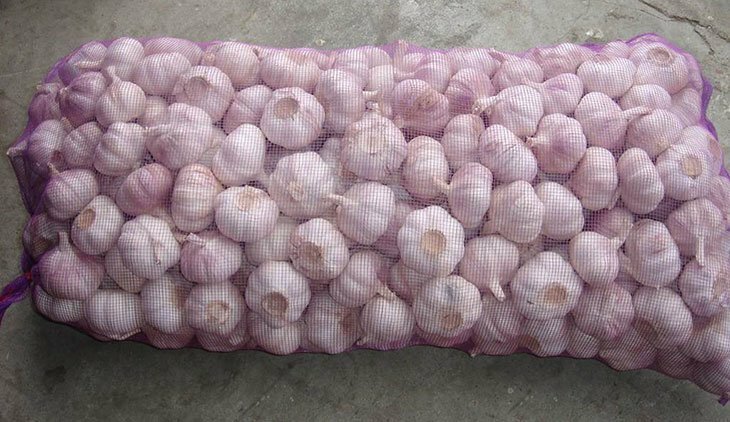 The simplest way to preserve your garlic haul is to place it in mesh produce bags that you can buy online. These are reusable and provide the air circulation your garlic will need to keep well. If the temperature drops too much, your bulbs will begin to sprout after the temperature rises again. This is why attempting to preserve store-bought garlic that was kept in the refrigerated section is a bad idea. If the humidity is too low, your garlic will dry out too quickly and shrivel. If the air circulation is poor, your garlic has a high chance of rotting. When cured, cleaned, and stored properly, garlic will keep for over half a year (sometimes over a year). 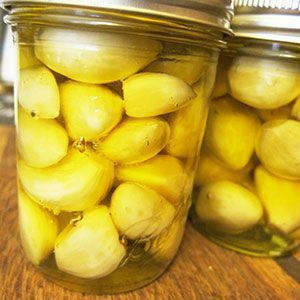 If you have fresh bulbs of garlic that you want to preserve faster than the method I outline above, there are a lot of different options for you. Some are better than others, and some popular methods of storing garlic can actually be quite dangerous — so read on. Storing fresh garlic in the fridge is generally not a good idea. This is because garlic bulbs are low-acidity, making them prone to Clostridium botulinum, better known as the culprit behind botulism. When you see garlic sold at the store in oil, it typically has a preservative like citric acid added to increase the acidity of the mixture, preventing Clostridium botulinum from forming. It is also stored at a lower temperature in commercial fridges than your fridge at home is capable of reaching in most cases. Unpeeled whole cloves — Leave the peels on and place them directly in the freezer after harvesting or purchasing. When you need to use them, thaw them out, unpeel, and consume. Chopped and formed into a block — Peel the skin off of your cloves and chop it into even pieces. You can form it into a block or any shape you wish, so long as you wrap it very tightly in a plastic bag or wrap. When you need to use it, you can grate it while frozen or simply break off a piece. Pureed in oil — Peel your cloves and then blend them in a food processor or blender with an oil of your choice. I like to use a high-quality olive oil. 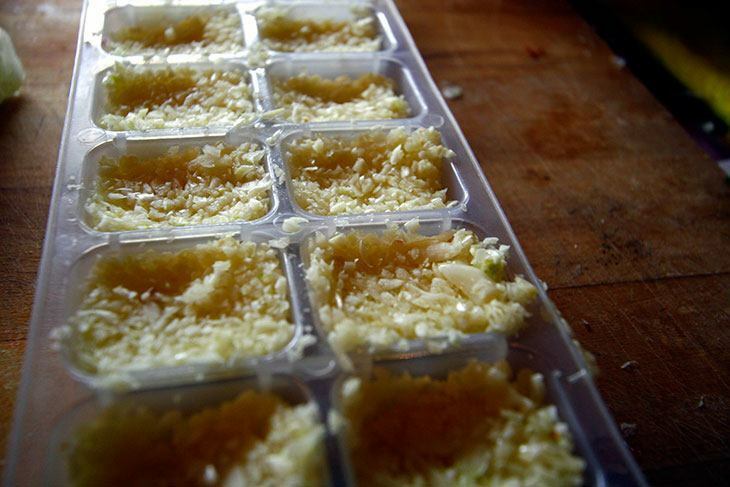 Because the oil won’t freeze completely, you can easily scrape some pureed garlic off for use in cooking. No matter which method you choose, it’s vital that you freeze it as soon as you’re finishing preparing. Don’t put it in the fridge or leave it out, for reasons listed in the fridge section above. It’s best not to can garlic. As mentioned in the refrigerating garlic section, it’s a low-acidity plant that is prone to ​Clostridium botulinum. The spores also proliferate in low-oxygen environments, which canned foods are known for. To dry garlic cloves, first be sure that they’re fresh and not soft or bruised. Peel your cloves and cut each of them in half. Dry them at around ​140˚F (60˚C) for two hours. After two hours, reduce to 130˚F (54˚C). Take them out of the oven or food dehydrator when they are fully dry. If you decide to store your garlic in oil, you need to be extra vigilant due to the potential for Clostridium botulinum development. Whatever you do, do not store at room temperature. In fact, it’s actually illegal for commercial garlic product providers to store their garlic in oil that hasn’t been acidified with something like citric acid. Because it’s not convenient to acidify your garlic + oil mixture at home, freezing immediately after preparation is best. If you use this method, keep a watchful eye for any unusual growth on the surface of your container. This is usually mold or yeast forming due to a higher than ideal temperature, so make sure your fridge is cold enough. Roasting garlic is my favorite way to cook it, due to sweet flavor that contrasts the typical flavor profile of most garlic. I love spreading it on bread or using it as a way to marinade meats. To roast it, simply chop off the tip of the bulb to reveal an inkling of the tops of the cloves. Then wrap them in foil and drizzle some olive oil over them. Place them in the oven at ​350°F (176°C) for about a half an hour to an hour. 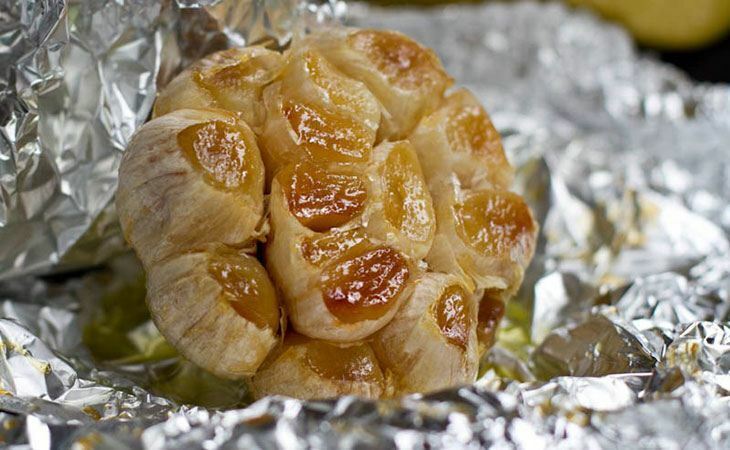 once the bulbs are soft, you can squeeze the roasted garlic straight out of the bulb. Pickling garlic is a favorite of many gardeners and chefs alike. It brings the pungent, strong flavor of garlic down a bit, meaning you can throw many cloves into a dish and the flavor won’t overpower everything else. I won’t get into a full garlic pickling tutorial here, but you can peel garlic cloves and throw them in the fridge with salt and vinegar. While storing fresh garlic in oil is a bad idea (unless you freeze it immediately), you can make garlic oil using dried garlic. Put chopped dried garlic into a small container and pour in some oil. Let sit for a while for the flavors to infuse and then use to your heart’s content. After you’ve dried garlic, you can make an easy garlic salt by tossing it in a food processor and chopping it until it is fine-grained. Add salt of your choosing to your garlic in a 4:1 ratio and pulse for a few seconds. Don’t blend too long — you’ll create too fine a mixture and it will clump up. 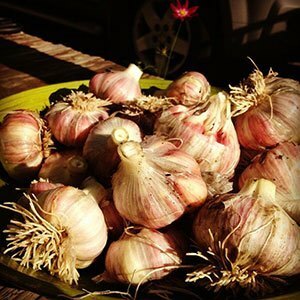 Do you have a favorite method for storing or using garlic? Let me know in the comments below! × How can we improve it? × Thanks for your feedback! 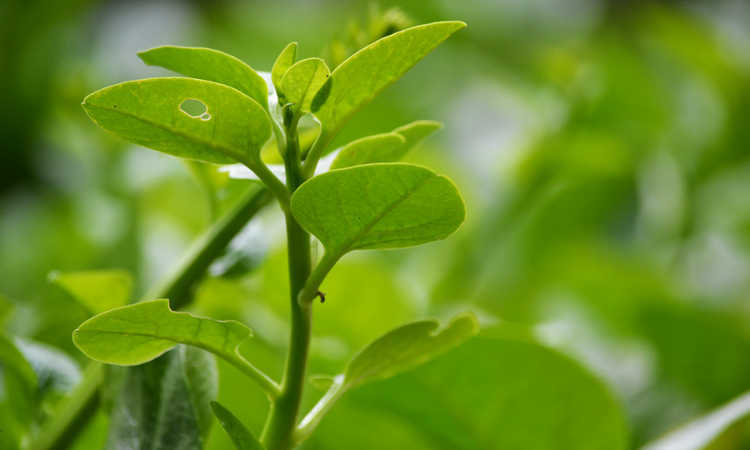 We're always looking to improve our articles to help you become an even better gardener. Our daughter dehydrated fresh garlic for 24 hours. What is the best way to store for a long time. If you’ve got fully dehydrated garlic, I would either put it into a mason jar with a food-safe dessicant packet to absorb any moisture, or store it in vacuum-sealed Mylar bags for long-term storage. I read an article about smashing fresh raw garlic cloves (from a farmers market) then put it in raw, unfiltered, local honey for two weeks in the pantry. Then eat a tablespoon a day of the “pickled” garlic. After reading your article I am afraid of botulism. Is that a concern with the honey process described above? That’s a very generalized way to describe fermenting garlic in honey! Honey-fermented garlic can be delicious, but what they don’t mention is that as the garlic ferments, pressure builds up in the jar. You will need to “burp” your jar daily to allow that pressure to escape, or use a fermentation airlock that allows the pressure to escape on its own. I like to use Masontops. They’re designed to work with wide-mouthed mason jars, and they’ll deal with the pressure for you! There’s other types of fermentation airlocks available as well, so if you have one already, use that. The resulting product is actually called ninniku hachimitsu-zuke, and it’s a traditional tsukemono, or Japanese pickle. Let me give you a few hints, though, because otherwise you may have problems. Use a sterilized jar that isn’t much bigger than the amount of garlic you want to ferment. It can take a lot more garlic than you think! Cover the garlic entirely with honey, leaving at least 1/2″ of empty space at the top (this stops it from bubbling out through the airlock on the jar). You need the garlic to stay submerged and not float up to the surface. After a few days, you may notice bubbles appearing in your honey, and that’s perfect, as it means that the natural fermentation process has started. It’ll actually take closer to a month for it to be ready. Two weeks isn’t enough time, definitely wait longer. During that time, the honey will darken and become thinner as the garlic juice mixes with it, and the garlic itself will naturally pickle and become sweeter from the honey it’s infused with. After a month has passed, you can store it in the refrigerator to stop fermentation. If your jar is sterilized and has some form of airlock (like the Masontops), the tools you use are sterilized, your garlic is fresh and the honey is good, and you keep the garlic submerged under the honey’s surface, you shouldn’t have any risks of botulism. And it really is quite delicious. I don’t eat it straight, but love to use it in Asian recipes! I just found tiny bugs with my garlic in the container in which I keep the garlic. What are they. If it’s been in the ground for years, has it been producing leaves every year? If so, what I’d do is to break apart the individual cloves and replant them. Any which are soft or squishy should be discarded, but if they’re firm, they may still be viable. Depending on the variety of garlic and where you’re at, there’s different times of year when it’s best to start garlic plants. You may want to ask the person what variety of garlic they were growing to find out when the best planting time for that variety would be. Garlic which hasn’t been producing leaves every year is likely long past its prime and should be discarded. 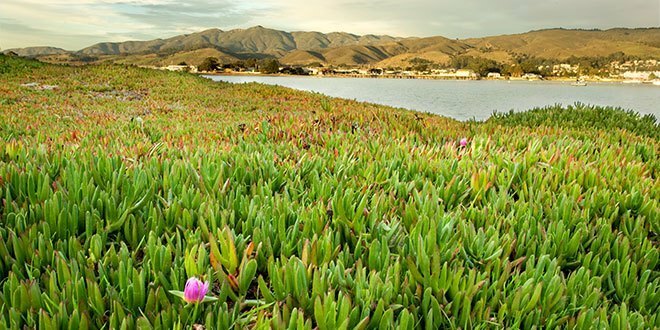 If it doesn’t have enough energy to grow, it likely is rotting inside the bulb. You can still try planting a few cloves if they’re firm, but there’s no guarantee that they’ll develop into healthy plants. If it’s already been roasted, I’d freeze what you won’t use in a week or so. You are correct, thank you! Fixed that. Hi, I'm Kevin. 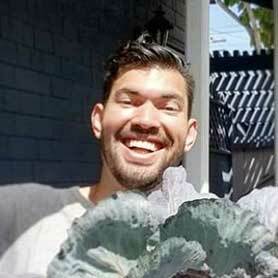 I created Epic Gardening to help teach 10,000,000 people how to grow anything, no matter where they live in the world. About me. 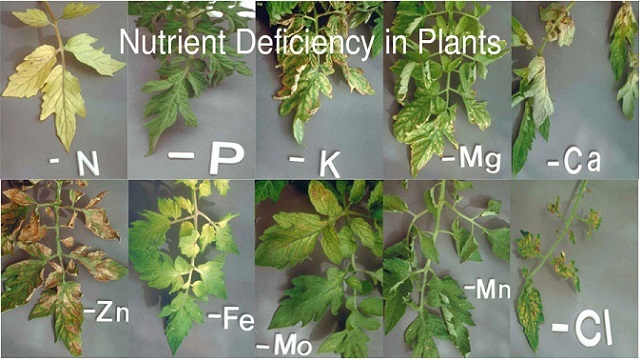 Ready to boost your yields? Sign up to get exclusive growing tips, techniques, and tricks delivered straight to your inbox…you won’t find these anywhere else!